Real-time program development can be split into a machine- independent phase, that deriv es a machine-independent real-time program from a specification, and a machine-dependent phase, that checks that the compiled program will meet its deadlines when executed on the target machine. In this paper we extend a machine-independent real-time programming language with auxiliary variables. 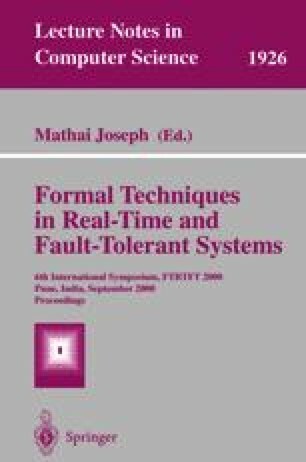 These are introduced to facilitate both reasoning about the correctness of real-time programs and the expression of timing deadlines, and hence the calculation of timing constraints on paths through a program. The auxiliary variable concept is extended to auxiliary parameters to procedures. I. J. Hayes and M. Utting. A sequential real-time refinement calculus. Technical Report UQ-SVRC-97-33, Software Verification Research Centre, The University of Queensland, URL http://svrc.it.uq.edu.au, 1997. M. Utting and C. J. Fidge. A real-time refinement calculus that changes only time. In He Jifeng, editor, Proc. 7th BCS/FACS Refinement Workshop, Electronic Workshops in Computing. Springer, July 1996. URL http://www.springer.co.uk/eWiC/Workshops/7RW.html.